The UK Government G-Cloud 10 is an initiative targeted at easing procurement by Public Sector bodies in departments of the UK Government of commodity IT services using Cloud computing. It has simplified how the Public Sector in the UK buys and delivers services by creating a pay-as-you-go marketplace of services that can be easily scaled up or down, based on the changing needs of a business and its users, thus encouraging the adoption of Cloud solutions and services across the UK Public Sector. With over 20 years of expertise, Version 1 Version 1 delivers best-in-class technology solutions that enable our customers to efficiently, safely and securely operate and effectively engage with end-users. Our organisation possesses in-depth knowledge of the Public Sector, demonstrating excellence in delivering successful solutions to a broad range of Public Sector customers. Such customers include the Rural Payments Agency and The Legal Ombudsman. The solutions that Version 1 delivers to the UK Public Sector are proven to reduce operating costs and support the Government’s agenda for Digital and Cloud-First, whilst ensuring availability and reliability for our customers’ key enterprise systems. Version 1 partners with global technology leaders to provide our customers with the highest quality solutions and services across application, database, infrastructure and cloud technology. Our long-standing and enhanced partner relationships with Oracle, AWS and Microsoft, and market leading expertise in each of these partner’s technologies allow us to tailor solutions to our customers’ unique needs. We are highly accredited by our global technology partners and have been recognised and awarded for our excellence in bringing technology enabled solutions and services which drive customer success. Version 1 delivers expert Digital Managed Services across all the major Public Cloud platforms, ensuring high levels of service availability, integrity and resilience. The level of investment by Version 1 in achieving the market-leading accreditation, expertise and competency required to deliver successful Next-Generation Digital Managed Services is evidenced by the achievement of this service provider listing on the UK Government G-Cloud. 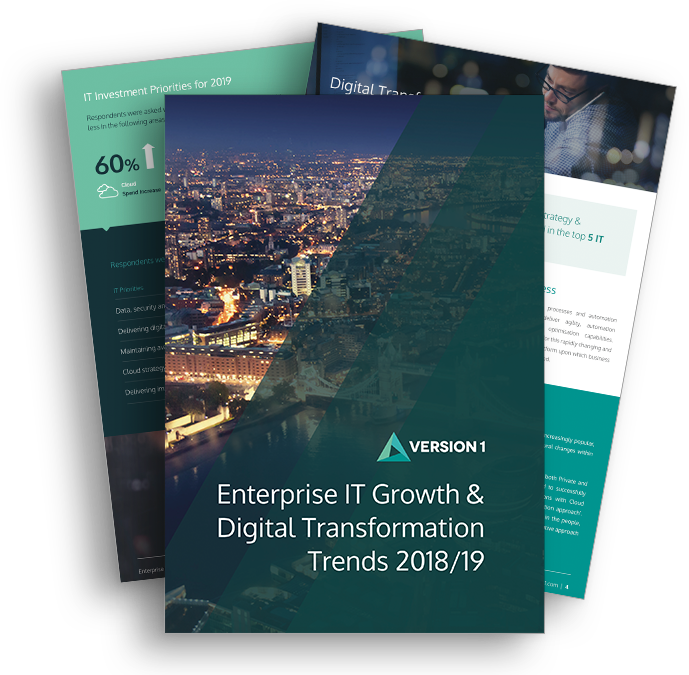 Version 1 specialises in the take-on and transformation of customer’s digital services and applications deploying next generation lean, automated solutions. We are experts in the integration and operation of diverse application landscapes ranging from modern cloud applications to traditional legacy applications. Version 1 delivers to global service standards (ISO 20000 and ISO 27001) and focuses on continuous service improvement allowing our customers to remain focused on their Digital Transformation Strategies.